FosterClub Young Leaders Ramond Nelson and James McIntyre traveled to Washington, D.C. this week, presenting at the CHAMPS-Brookings Convening. Joined by FosterClub Executive Director, Celeste Bodner, they discussed how policies and practices lead to foster parents being better equipped to support and engage young people. 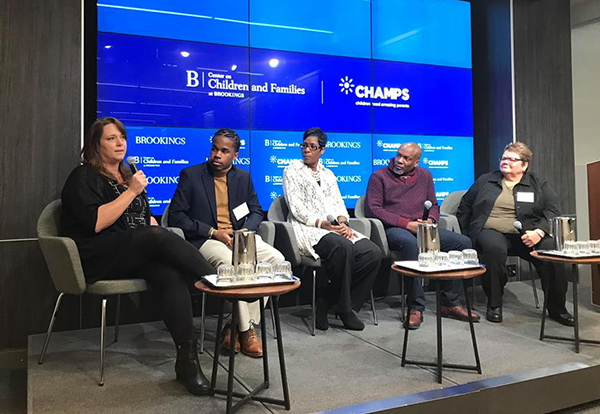 FosterClub is a proud partner of CHAMPS, a national policy and communications campaign to ensure bright futures for kids in foster care by promoting the highest quality parenting. Learn more about Ramond Nelson, a 2018 FosterClub All-Star and James McIntyre, a 2011 FosterClub Outstanding Young Leader and member of the National Policy Council.